There’s nothing quite like a good burger and Atlanta, with its recent burger renaissance, is a fine place to explore the classic American treat. So when needing something quick, satisfying, and relatively close to Buckhead for lunch, I went to see Grindhouse Killer Burgers’ new location on Piedmont Road. I haven’t had the opportunity to try the original location, but just looking at the menu, this burger place has potential. Electing to save the build your own option for a later time and date, I went with two of the house burger styles. First up was the cowboy style burger. 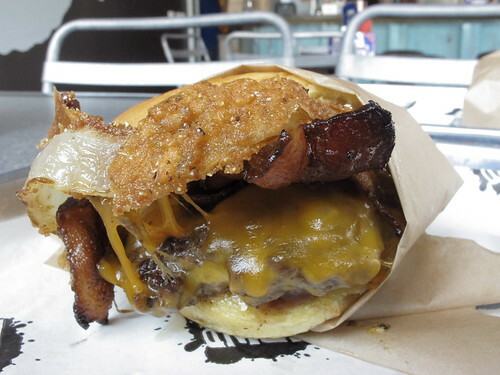 Consisting of a single patty topped with thick cut bacon, cheddar cheese, a Vidalia onion ring and bbq sauce, it looked spectacular. With a pillow soft bun, sweet and slightly tangy bbq sauce, and a big, crispy Vidalia onion ring, this burger had all the right toppings but the patty didn’t really show up for the party. This was a decent, albeit salty burger, but there wasn’t very much beef to stand up to the toppings, especially the bacon. I knew I should have gotten a double. Simply because a burger is always made better with the addition of fries, I also ordered a side of Grindhouse’s crinkle cuts. 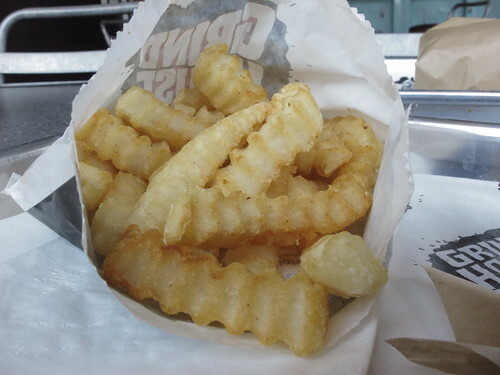 Once I tried this limp waste of potatoes, I realized I should have ditched the fries and gone with the double patty burgers. 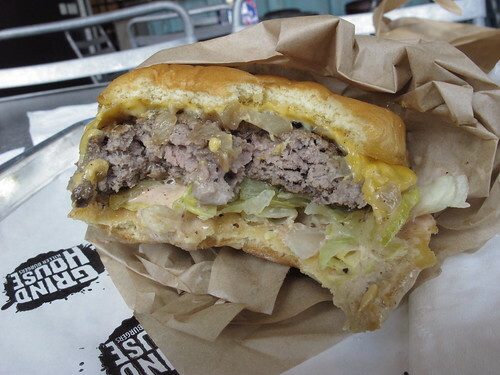 In an effort to get a baseline reading on Grindhouse’s style of burger, my second burger was the Grindhouse Style. 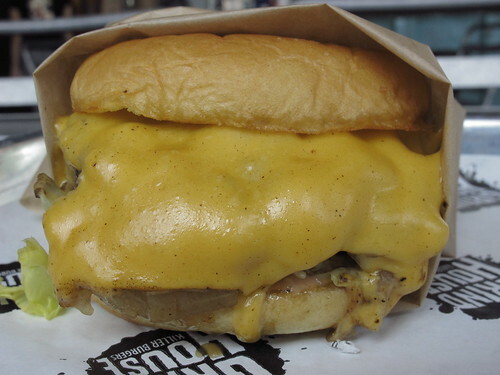 It was almost criminal to eat this burger, the American cheese was just too beautifully melted, but I made the sacrifice and took a bite. With onions, pickles, and Grindhouse’s take on 1000 island dressing, this was a decent burger, but the beefy addition of a second patty was sorely missed. This first look at Grindhouse revealed a few things. First, it wouldn’t hurt for Grindhouse to cook their burgers a little less. Second, when in doubt, go for the double patty. 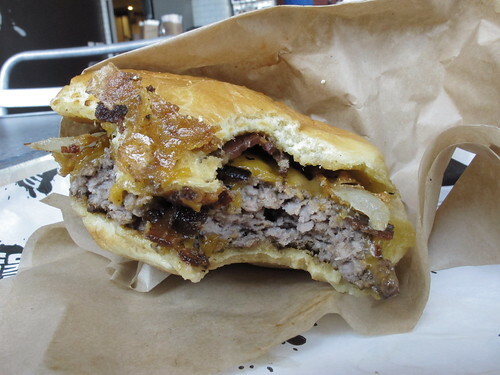 Based on some glowing reviews, the double decker is really the key to beefy goodness at Grindhouse. Hopefully that little trick holds the key to success at Grindhouse, but that will have to wait for my next trip to Atlanta.